After my last £6 supper on BBC Radio Berkshire, Paul Ross was quite disappointed that the recipe included no frozen peas. It got me thinking that actually there’s plenty to celebrate in the humble frozen pea. They’re cheap, you can always keep some in the freezer and they are a welcome shot of greenness and sweetness at this time of year. This quick, easy and cheap meal is a little mid-week fanfare of the frozen pea. Get a large pan of salted water on to boil. Heat a frying pan to a medium heat and add a little oil then put in the onion and leave to soften for a few minutes. When the water has boiled add the pasta and cook according to packet instructions. While the pasta is cooking add the bacon to the pan with the onions. Fry the bacon and onions together until the bacon is golden. 4-5 minutes before the pasta is ready add the peas to the pan with the pasta in and leave to boil until the pasta time is up. After the peas have gone in, add the cream to the bacon and onion with plenty of black pepper, reduce to a slow heat and stir regularly to warm the cream and slightly thicken it. 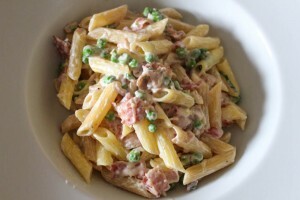 Drain the pasta and peas then stir through the cream and bacon. Add the mint and taste to see if you need to add a little salt and then mix in the Parmesan (if using). 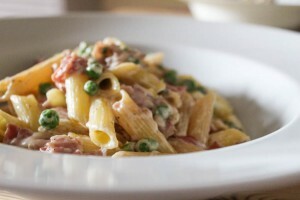 Comforting, filling pasta; smoky, salty bacon; sweet, popping peas; a slight creaminess and a hint of cheese. I don’t think you can ask much more from a dinner. I almost always have these ingredients in the house so I think this will be making a regular appearance on my table. On writing this I thought perhaps this would make a nice dinner for tonight. I then remembered I used the last of my frozen peas making this one. Just had me some variation of this yesterday aka Spaghetti Carbonara! I love the peas nice and plump. Nice and something I am seriously gonna replicate for this weekend. Have most of ingredients already at home. Wow sure love this economical and delicious dish! Nice one. But you forgot to factor-in the price of the bottle of Valpolicella! I love the combination of flavours in this dish. It’s exactly what I’d love to eat in the evening. Frozen peas are such a great ingredient to have around. They let you easily add a veggie into virtually any dish!